When the first Black Ops hit the scene, it brought some freshness to the Call of Duty franchise by moving away from Modern Warfare’s setting and bringing it back to the Vietnam War and the Cold War. A different game engine was used for that installment as well as different rewards for kills and leveling up. While some of the changes were nice, the game still felt too similar to other Call of Duty games and the hit detection was horrible. Treyarch, the developer for the Black Ops branch of the Call of Duty brand, made a number of improvements in “Call of Duty: Black Ops 2.” The graphics are cleaned up, and look absolutely gorgeous. The game engine’s hit detection system is also greatly improved. 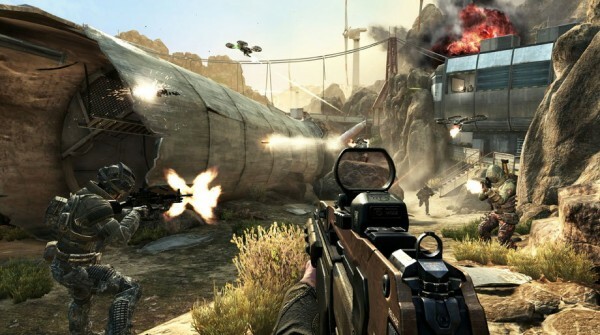 Black Ops 2 players, both returning and new, can expect a deep multiplayer that doesn’t deviate too much from its roots. They can also expect an exciting and gritty campaign that will leave them on the edge of their seats. The Zombie mode of the game also delivers good gameplay and new game modes. Black Ops 2 delivers an awesome multiplayer experience with 13 original multiplayer maps and 13 different game modes. All of the game modes other than “Hardpoint” have been used in previous Call of Duty titles. In Hardpoint, there is a neutral base on the map and you have to capture it to get points. The site moves around after a certain amount of time. It’s very similar to King of The Hill in that opposing players can take away control of the base and you cannot score points if an opposing player is on your captured base. The guns in Black Ops 2 are mostly new to the franchise due to the game’s futuristic setting. The starting weapons are decent enough that you can perform well with them, but players with higher level weapons will have a slight advantage in the game. At the moment, the strongest weapons seem to be the submachine guns. This game, so far, is dominated by guns with a faster fire rate, and the submachine guns beat out the other types of weapons. This may change with updates to the game. The single player Campaign is about David Mason, son of Alex Mason. He and his squad of Navy Seals are trying to stop a man named Raul Menendez from destroying the United States and China. The game intersects with Alex Mason’s story from the 1980’s when he was trying to capture and kill Raul Menendez. The player will jump back and forth between the past and the future, filling in plot holes and keeping the player on the edge of their seat. Players should understand that this game is rated M for a reason. It is very graphic in its depiction of war and uses very strong language. It does not shy away from torture or gruesome death scenes, but players can turn off this graphic content in the settings menu. Treyarch decided to mix things up and add “Strikeforce” mode into their single player campaign, which ties directly into the main story. These missions have you take control of varying numbers of Navy Seals and drones. Some missions have the player defending an objective with their squad while others will have you attack an objective. Each mission has a time limit and they are only available for a certain amount of time during the campaign. Zombie mode is back. With the popularity of zombies these days, this game mode has been a huge draw for the Call of Duty franchise. In Black Ops 2, players get a lot more variety than they did in World at War and Black Ops. Black Ops 2 provides three Zombie maps and three game modes. Two of the game modes, “Tranzit” and “Grief,” are new to the series. In Tranzit, players find themselves able to travel between all three Zombie maps either by using a bus driven by a robot or they can run through the fog and hope to survive. Tranzit also provides an opportunity for players to learn a little bit about the history of the zombie outbreak.